Boxing gloves are numerous but differing in their purposes: training gloves, amateur gloves, bag gloves, and competition gloves. The padding should be right to avoid hurting your sparring partner or opponent. Sparring gloves which can either be Velcro or laced-up versions need to have enough padding at the knuckles, and excellent wrist support. They should allow wearers remain fluid and mobile while allowing them to throw quick punches one after another without harming each other. Below are reviews of the four best sparring gloves in the market on gloves. Sparring gloves are worn when a boxer is training with an opponent to finesse his technique. Thus, boxers are bound to spar at all levels and using particularly a pair of sparring gloves is more recommended due to the protection afforded by the extra padding. In this article, we will review some outstanding options of best sparring gloves and go into further details of what needs considering when choosing and maintaining a pair of sparring gloves. 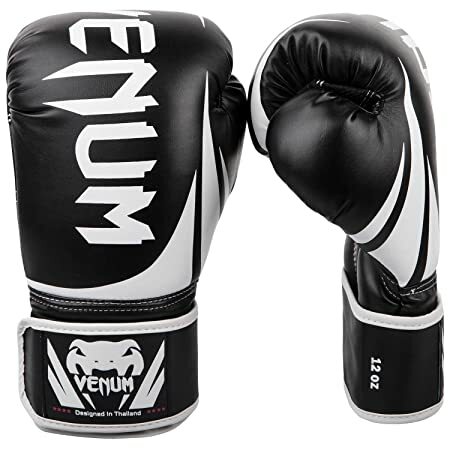 The Venum Challenger 2.0 boxing gloves are ideal for lightweight performance and can be used by both the beginners and intermediate levels. The glove is constructed with PU leather ensuring for a durable and effectively performing product. This glove comes with triple density foam padding which acts as great shock absorber thus provides for longer sparring sessions since the hands are protected effectively. The glove feels natural due to the anatomical design which together a Velcro enclosure provides for better wrist support and a snug comfortable fit. The glove is durable due the PU leather used in its construction. The Velcro enclosure offers a secure fit that supports for proper punching technique together with excellent wrist support. The fully attached thumb, is a feature that ensures safety especially during striking while eliminating accidental injuries like eye gouging. The interior is made up of a mesh which serves the purpose of aerating the glove and serving as a thermal regulator. This is a handcrafted pair, made in Thailand with extra padding and a wrist support that is excellent. The glove is constructed to offer quality and durability from the leather material that is used. These gloves are designed depending on the Thai style where the knuckle area has less padding and a lot more padding goes to the back of the hand. 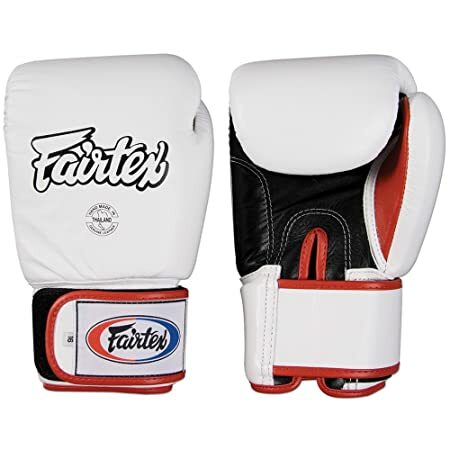 The Fairtex Muay glove can be used for all purposes like bag training and bag work. The wrap-around hook and loop closures are comfortable while still securing the wrists properly for protection. The gloves are constructed from pure leather which makes them durable a fact that is complimented further by the solid stitches on it seams. They can be used for other purposes as well like training and bag work. The gloves offers a perfect fit. The gloves are very tight fitting leaving little room for knuckle wrapping. They are lightly padded at the knuckle area which makes them wanting and can leave the wearer sore. 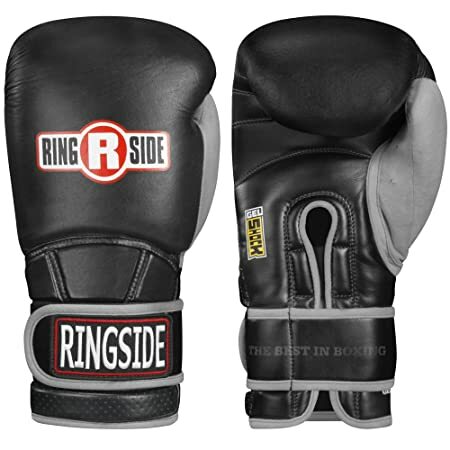 The ringside sparing gloves utilize the latest technology of shock absorption by adding a gel lining to its feature. This feature ensures full protection from the gel shock padding system which allows the user to train for longer. The glove has an innovative feature added, by way of a suede thumb which allows the user to wipe off sweat from his brows with ease. Some amount of flexibility is allowed to the wrist due to a wrist hinge that is used and a segmented cuff that acts as a second hand wrap to stabilize the wrist. The glove is durable due to the leather material used in its construction. Full protection is offered on contact areas due to the shock absorption technology that is used. The suede thumb innovation is a great way of ridding your brows of sweat. Full support is offered to the wrist by the addition of a segmented cuff that acts as its second hand wrap. Size difficulties and seem to be made for smaller hands. The glove seems to tear apart from the insides despite the durable leather of the outside. The rival high performance sparring glove offers the ultimate sparring experience by providing sufficient shock absorption thus protecting the wearer effectively. This ultimate sparring glove ensures that the user does not get sore knuckles even on administering very high strikes. The shape is well engineered to form a natural perfect fit, with a double wrist support system that secures the wrist firmly. This leather constructed glove oozes of quality and durability and has a separate thumb design which together with the Ergo Xtrem Strap system. This makes it stand out and for the price it is offered at, extremely affordable. The glove also features an ultra-comfortable inner lining which is laminated to ensure the glove is durable even from inside. This glove offers a superior protection to the hands from the excellent amount of padding used in its construction to ensure proper absorption of shock. The gloves are made from full grain leather which makes them durable. The glove is a comfortable fit. They are a perfect fit even for people with large hands. The double wrist support system secures the wrist properly reducing chances of injuries. The glove is affordable for its class. The strap needs help from someone else when putting it on. Sparring gloves are the gloves that a boxer will use in the ring. This pair is specifically made to offer protection to both the wearer and the opponent. Sparring gloves are made with the shock absorption feature in mind so that less force is transferred to the sparring partner thus hurting him/her less. Sparring is meant to develop technique in the boxer but to knock down the opponent like in a competition thus the reason why sparring gloves come much heavier than the competition gloves. Sparring gloves are recommended at 16oz. Sparring gloves protect the wearer against impact thus ensuring they can train for longer periods without causing harm to the opponent or his knuckles; they will therefore come with extra padding. They are usually made of leather and very keen stitching which ensures durability. The modern sparring gloves come with a natural curve to them which will also aid in keeping the thumb in its place. This will prevent injuries to the user. Most of the sparring gloves come either with a Velcro wrist closure or hook and loop. There are numerous brands to choose from in the market. Some brands may have size difficulty. Vinyl made sparing gloves may come cheap but are not durable. Enough padding to lessen the burden on the users hands by offering enough cushioning against the impact that should occur with each punch. This feature allows the wearer to train for longer periods without soreness to the knuckles or tiring. Enough padding will not only safe guard the user, but also keep the opponent from harms ways from the lethal punches thrown his way. Proper fit ensure the sparring glove of choice fits snugly with the hand wrap on. Since all boxing gloves come in different sizes which will affect the wrist fit, make sure to get the right size that will fit properly to offer sufficient protection to the wrist enhancing proper technique. Material used in construction of the glove. Ensure to get leather made gloves to ensure durability. Gloves can be constructed from vinyl, manufactured leather or real leather. Vinyl may come cheap but offers less longevity; whereas the manufactured leather may not be as expensive as real leather it will also not last as long as the real leather. Besides, the fake leather will not break in and remains stud through-out its use which is different for the pure grain leather gloves; they break in petty well and will wear like a second skin with time. The closure system may be of preference since the gloves can either have a Velcro closure or have laces. The Velcro straps are really ideal in situations where the user is training alone since they don’t require assistance from another person when wearing them. However the lace up gloves will require assistance from another person in lacing them up. For sparring gloves this should not be a big issue since sparring involves an opponent in order to improve technique. Brand: the brand that one settles for matters a lot when choosing to purchase the best boxing glove. Toy brands will offer poor imitations that lack the specifications of the real standard of the glove. The toy brands will definitely come cheap and are mostly manufactured by large chain retailers and purchase of such gloves can end up being injurious to the user and his opponent. Color: Certain color schemes are harder for the human eye to see; which is the reason why most boxers prefer red gloves since the opponent will not see the punches coming his way easily. The hour one trains should also be a consideration when choosing a sparring glove. For instance persons who train in dimly lit areas or at night can use gloves that are light in color since they will be more visible thus ensuring punches are landed correctly without missing targets. However, color can be a consideration when wishing to look cool to lift morale or just as a matter of preference and style. Sparring gloves are not hard to put on. Once the user has wrapped the hand wrap in a proper but preferred technique then he will need to just slip his hand into the glove by exerting a little effort from the upper arm. The hand should be slid in fully ensuring no spaces are left and a snug fit afforded. The glove can be maintained by using clean hand wraps, wearing it properly for a proper fit, cleaning off the sweat and drying it off completely. A little salt water can be used to wipe off the insides of the glove to kill off any bacteria that may be lurking around due to the sweat which is en-evitable. Hand wraps should be cleaned and dried properly to avoid bad odors, and also to ensure the glove remains clean and odorless too. After every use proper airing of the gloves should be done, and at no time should these gloves remain in the bag since they will stink. It is essential to get the correct boxing glove to serve each purpose and sparring gloves should be used for that purpose. 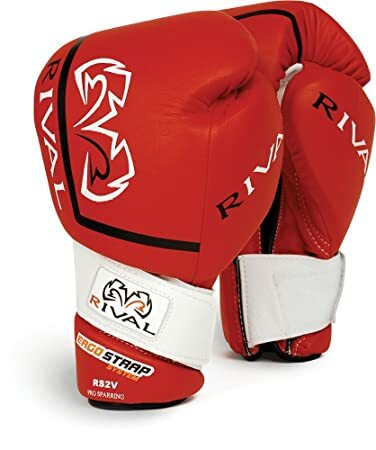 However, while shopping for these gloves it is notably important to keep safety in mind, quality, durability and comfort in order to enjoy a good bout. Important to note too is the fact that sparring gloves can and should not be interchanged with bag gloves or any other kind of glove.